March 19, 2011. Daisy J is getting a sister, Delphinidae, Pacific Dolphin #256 is coming in from San Diego. Click here to see her. September 27, 2009. Bob checked in with the following picture and email. 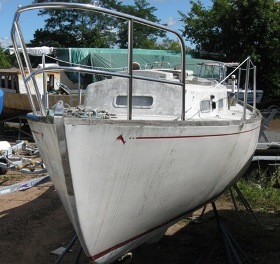 I’ve been a frequent visitor to your site for a while, but have been waiting until I had more restoration progress to report and better pictures of our Dolphin to share (wishful thinking!). 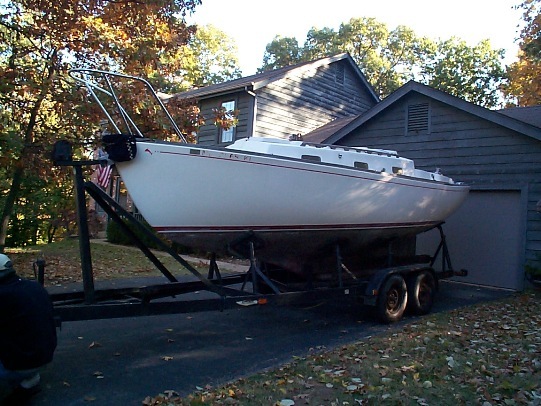 In any event, “Voyageur” was an eBay find – more or less – a couple of years ago. She had been donated to, and was being sold by, a charity (in Michigan, as I recall). I fell in love with her, but I wasn’t the successful bidder. In those days one could see the ID of eBay bidders, and so I was able to email the winner. I sent him a note to the effect “congratulations, but if you ever decide to sell, please let me know.” And sure enough, I heard from him a few months later. The attached photo was taken the day we picked her up in St. Louis, to bring her home to Texas. We bought a ¾ ton Ford to tow the Dolphin – also an eBay purchase – from San Diego. I had bid on the truck and gone outside to do some yard work, unintentionally leaving the eBay page displayed. I had discussed the Dolphin purchase with my wife, but neglected to mention the truck. I’ll never forget when, a few hours later, she came out and asked, ever so sweetly, “Honey, did we buy a truck?” Oops! Thank Heaven I’m married to an angel. Jim Huxford had passed away shortly before, and his website was already gone. I had been in contact with his widow and, later, his son (as I recall), trying to learn if any of his material was still available and could be preserved, but they couldn’t find it. I’m very glad you were able to get it, and appreciate all the work you’ve done on Dolphin24.org – it’s terrific. I’ve not made a lot of progress on the restoration. What really triggered this note was another Dolphin sighting. In eBay listing 190337069870 (and several previous listings – deadbeat bidders are the bane of eBayer sellers and a blessing for hesitant buyers) – a fellow has been trying to sell his Pearson Triton (I’m a sucker for classic plastic). And sitting right next to her in the yard, and visible in a couple of the pictures, is a Dolphin. I’m pretty sure she’s Nalina. If so, she’s not a new find, but fun to spot her, just the same. She’s queen of our fleet (some say addiction, other’s “bad habit”) which include an O’Day Day Sailer “Texas Dream,” a 17’ Buccaneer daysailer “Blue Skies,” a 15’ Starcraft Capri runabout “Sunshine,” a 21’ Thompson cuddy “Bob’n,” and a Gulf Coast 21 “Rising Sun.” But there’s a method to my madness (and master plan): Bob and Daisy own “Bob’n,” “Daisy J.,” “Sunshine” and “Blue Skies.” “Rising Sun” was a local find – $5 for boat, sails, outboard and trailer – and way to sail while our projects are, well, projects. Ah… life is good. Webmaster Note: Yes! 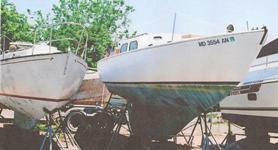 The boat in the background of a couple of pictures on the Ebay ad for the Triton is Nalina! Good Work, Bob!! We’re about 55 miles northwest of Dallas. The lake we most often sail is about 30,000 acres, but Lake Texoma is nearby and about three times as large. The Gulf coast is about 250 miles down the road… we run down for a weekend at the beach from time-to-time. Haven’t trailered any of the boats down there, but why not…? I grew up in the northeast, but been in Texas since the mid 90’s. Had finally come to my senses, as we say. We think differently about distances down here… a few hundred miles to go to the beach is no big deal. We flew to San Diego, but drove the truck back. Then used the truck to fetch the Dolphin from St. Louis, as I mentioned. We drove to Wisconsin to bring the Thompson home. The Starcraft was from Oklahoma – relatively nearby. Besides her pedigree, the fact that we can trailer the Dolphin to distant waters was an attraction. We’ll sail in the Gulf, for sure; but the plan is to sail in both oceans before we’re done. And the Great Lakes, too… why not? I’m planning to replace the ports on Daisy J. with some opening, oval portlights I got at a really good price. I want the additional ventilation, and I’ve always liked the shape (but I probably would have stayed with rectangular if I could have afforded them). When I make that change, I’m also planning to veneer the deckhouse with some gorgeous mahogany I’ve got. Saw a terrific article a year or two ago in the Jan/Feb ’08 issue of Good Old Boat… where a guy vacuum-bagged a veneer laminate to his cabin sides. A little scary, but I like the look. When I work up the courage and time, I’ll be sure to document what I’m up to for Dolpin24.org.